Human beings use different languages to express their feelings and experiences .In English there are two different ways used to express things. A statement given by the speaker himself is direct form of speech whereas the same statement conveyed by another person to someone is indirect way of speech. Howard told his brother that he was going to the market. When the actual form and words of the speaker are used, it is direct speech but when one gives the substance of speech of the speaker it is indirect speech. These two parts are separated from each other by a comma (,) and inverted commas (“ ”). The part outside the inverted commas forms reporting speech (i.e. who is reporting and to whom) and that enclosed within the inverted commas is reported speech (i.e. the matter that is being reported). The first word of the reported speech begins with a capital letter. 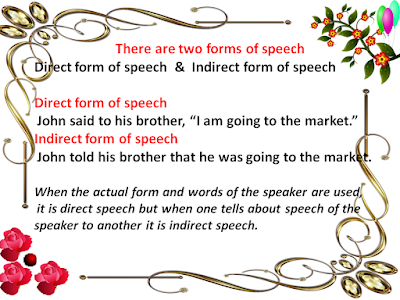 Change of direct speech to indirect speech is explained in detail in the following paragraphs. 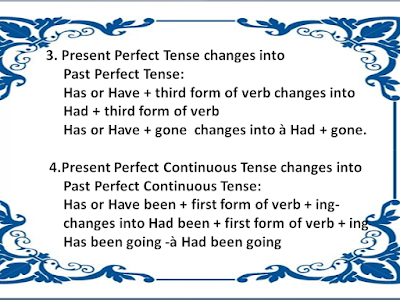 While changing Direct speech to Indirect speech, the rules of ‘Sequence of Tenses’ are followed. A. 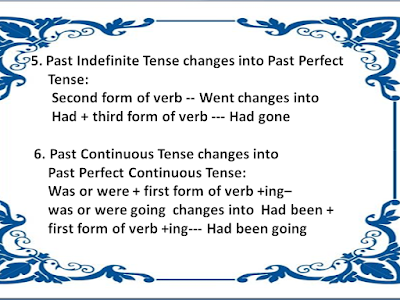 If the reporting verb is in the Present or Future Tenses, the tense of verb in the reported speech is not changed at all while changing from direct speech to indirect speech i.e. Indirect –He says that John paints a picture. Indirect –He says that John painted a picture. Indirect –He says that John will paint a picture. Indirect –He will say that John likes that picture. Indirect –He will say that John liked that picture. Indirect –He will say that John will like that picture. Has or Have + gone — Had + gone. 7. 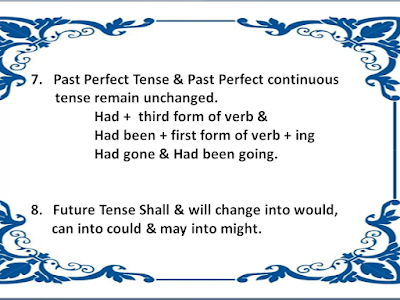 Past Perfect Tense & Past Perfect continuous tense remain unchanged. Had gone & Had been going. 8. Shall & will change into would, can into could & may into might. C. But if the Reported Speech expresses some universal truth or habitual fact, then the tense of verb in the reported speech is not changed into the corresponding Past but remains exactly as it is. He said, “Man is mortal.” – He said that man is mortal. He said, “Two and two make four” He said that two and two make four. Tomorrow – the next day, Ago –before. E. The verb in reporting speech is changed into told, asked, ordered, requested, advised, exclaimed or some other such word according to the form or sense of the sentence. 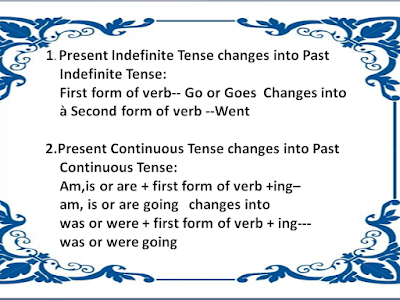 F. If the reported speech contains different kinds of sentences all of these are changed according to their form with help of suitable words. A sentence generally comprises of Subject, verb and object. He-Subject, sings-verb and a song-object. Sentences with intransitive verbs do not have an object. He sleeps. The child weeps. Here sleeps and weeps are intransitive verbs. These sentences have no object. In similar way, sentences in reporting and reported speech generally have these three parts- subject, verb and object. If reporting speech does not have any object, its verb is not changed i.e. f reporting speech has an object, ‘says’ in it changes into ‘tells’ and ‘said’ changes into ‘told’. According to the meaning or sense of the reported speech ‘said to’ in the reporting speech also changes into words like stated, informed, asserted, reported or complained etc. Inverted commas in the sentence are removed and after reporting speech the word ‘that’ is used. In the indirect speech, First person used in the reported speech changes according to subject in the reporting speech. Second person in the reported speech changes according to object in the reporting speech. Third person in the reported speech does not change. In this sentence as there is no object in reporting speech ‘said’ will not change. Comma and inverted commas will change into ‘that’. ‘I’ is first person and it will change into subject which is ‘he’. ‘I’ will change into ‘he’. ‘like’ will change into ‘liked’. Him is third person, so it will not change. He said that he liked him very much. ‘Said to’ will change into ‘told’. Comma & inverted commas will change into ‘that’. 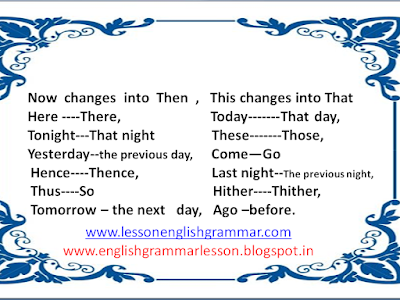 ‘I’ will change into ‘he’. ‘You’ is second person, it will change according to object ‘her’. He told her that he liked her very much. ‘Said’ to will change into ‘told’. ‘Your’, second person, will change according to object ‘him’. It will be ‘his’. ‘Is’ à ‘was’. ‘My’, first person, will change according to subject ‘She’. It will be ‘her’. She told him that his brother was her friend. He told me that he had not told a lie to my brother. They told the stranger that he could not leave their house like that. The boy told me that I had not stolen his books. The girl told her mother that she would go along with her to the market. The doctor advised the patient that he should take that medicine regularly if he wanted to be well. You told me that you were not preparing for your examination. 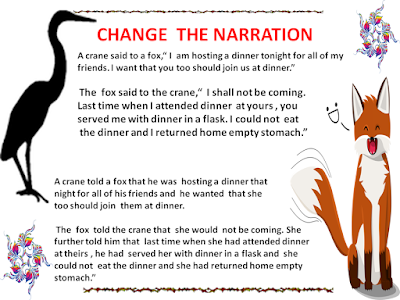 Just see the following sentences and identify subject and object in the reported and reporting speeches and co-relate them with each other to change the sentence into indirect speech. The teacher,subject, is –third person. your mother,object, is also a third person. ( Here the possessive pronoun ‘your’ should not be misconstrued as second person. “your mother” is a third person. I,subject, is first person and your is second person & my is first person. The teacher told your mother that he observed that her son was the most brilliant student in his class. Your mother said to him,” I agree with you but I want that my son should also stand first in the class. Reporting speech—-Your mother,subject, is –third person. him,object, is also a third person. 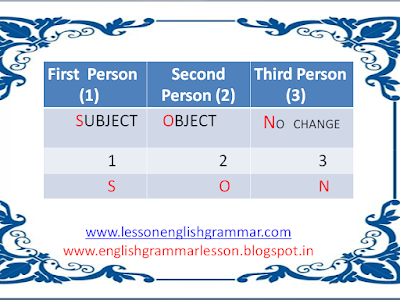 Reported speech —– I,subject, is first person and you is second person & my is first person. Your mother told him that she agreed with him but she wanted that her son should also stand first in the class.